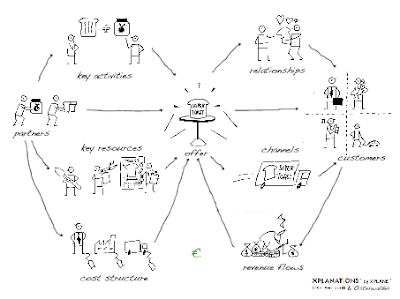 Alex Osterwalder, an author, speaker and consultant on business model innovation has developed a powerful tool to describe business models in a structured, simplified and understandable way. This was, together with an overview and synthesis of existing literature about business models, perhaps the main contribution with his dissertation on business models in 2004. It is also the basis for the beautiful book he is currently finalizing on the subject. A very valid point Osterwalder makes, that also Linder and Cantrall made in 2000, when discussing the confusion related to the concept of business models, is that many people speak about business models when they only mean parts of a business model. By having a common understanding, and a visual representation, the users of the canvas can easily separate what parts are being discussed and relate it to the overall picture. There are many different opinions among business practitioners and academics on how to define the term business model and what elements to include. Osterwalder's business model canvas is a very good attempt to compile the different existing models and he describes the different elements that he believes should be included in detail in his dissertation. He constructed his nine elements of the business model from the different business model building blocks that had been mentioned by at least two other authors prior to his work. The result is a business model canvas with 9 different business model elements. What makes the business model canvas a really powerful tool is that it gives a simplified overview and helps people visualize and communicate their ideas. In his workshops Osterwalder often puts the canvas on the wall and have his participants draw their own business model. I sometimes get the question how I relate to Osterwalders's business model canvas and what I think of it. And the answer to that is that I find the canvas very helpful and a powerful tool to discuss most business models. I often use it, explicitly or implicitly, to get a quick and structured picture of a business model. Also, as with the element “customer relationships” I would perhaps include a “partner relationships” as it can vary from loose supplier relationships to strategic alliances, joint ventures etc. Finally I often find it useful to turn the model around starting with the customer or stakeholder far to the left and ask "who could we potentially provide value for?, what are their needs?" then look at what internal and external assets and capabilities that could be used, combined or developed into value propositions. It’s a great tool and for those of you interested to know more check out the book chunk project.